Want to book a boat charter? Email charters@mdaguam.com to make your booking. Our boats are popular! Please contact us as far in advance as possible in order to get the specific date you have in mind. One month notice is usually the minimum, especially for a weekend reservation. Cancellations must be made at least two weeks prior to your trip date or you will forfeit your deposit. Trips cancelled by MDA due to inclement weather/rough sea conditions will be rescheduled or fully refunded. Boat, captain and crew. An ice chest is on board, tea and water. Food, drinks, ice, additional ice chests, picnic supplies, etc. Is not included but may be rented. Scuba gear cannot be delivered to the boat. Snorkel bucket (15 Sets of Mask & Snorkel) $50. To take advantage of this offer, we need a list of people renting, along with the gear they need two days prior to the scheduled trip. 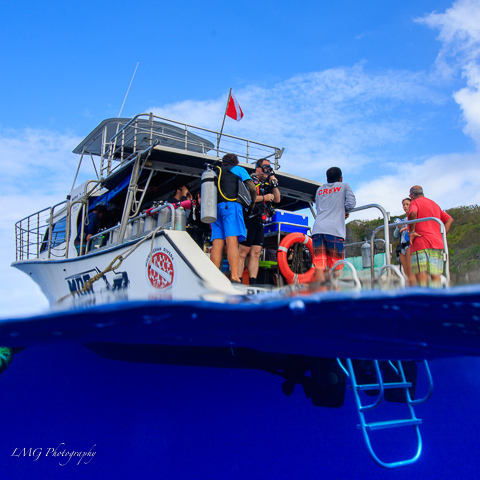 Our vessels are rated for a maximum of 30 divers. For non-diving groups, the maximum is 45 people on board. If you have a “mixed” group, please contact the boat operations department to find out the maximum number of passengers. Children under 3 years of age are not allowed on board. Pre-school children on board must be accompanied by an adult at all times. Note: all children are counted and included on the passenger count. Casual beach wear, sandals or zoris (sensible footwear for wet boat decks). No high heels or prom clothes. Don’t forget to bring sunscreen. Although our waters are usually very calm, some passengers may be more comfortable taking sea-sick medication prior to departure. A change of clothes and extra towels for the kids is a good idea. Don’t over pack – space is limited. Most of all, PREPARE TO HAVE FUN! Dive sites can change without notice due to changing conditions, the captain can select alternate dive sites for your safety and comfort. There will be no refund or credit issued when this occurs. Email charters@mdaguam.com to make your booking.